The United States is undergoing a demographic shift that is changing older Americans' relation to the workplace. The average and median age of the U.S. population is rising, and the composition of the workforce with it. By 2020, it is estimated that workers 55 and over will make up 25% of the U.S. civilian labor force, up from 13% in 2000. In addition, individual workers are tending to remain in the workforce longer and retire later. The number of workers over the traditional retirement age of 65 is seeing a marked increase, and it is projected that they will make up more than 7% of the American labor force by 2020. Employers rate older workers high on characteristics such as judgment, commitment to quality, attendance, and punctuality. 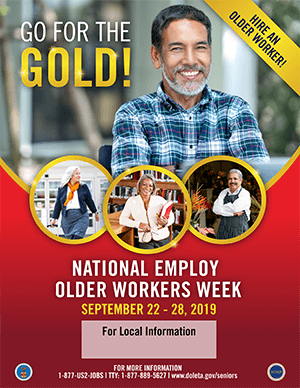 National Employ Older Workers Week, held annually the last full week of September, recognizes the vital role of older workers in the workforce. National Employ Older Workers Week aims to increase awareness of this labor segment and develop innovative strategies to tap it. It also showcases the Senior Community Service Employment Program (SCSEP), which provides on-the-job skills training to individuals 55 or older with limited financial resources. Since its inception, SCSEP has helped over one million older Americans enter the workforce.